F1's youngest points scorer, F1 youngest race winner and a championship contender in his second full season. Success has come quickly to Sebastian Vettel, whose youthful, enthusiastic personality belies a steely, focused will to win. His maiden victory in torrential conditions in Monza behind the wheel of a Toro Rosso marked him out as F1's latest rainmeister and made the whole paddock sit up and take notice. But there were still some who doubted his outright credentials as a megastar. These were dispelled in emphatic fashion at Red Bull this year. He trounced team-mate Mark Webber 15:2 in qualifying and his wins at Silverstone and Suzuka were the work of a world-class talent. Given his nationality comparisons with Michael Schumacher are inevitable. The fact these are proving to be justified is as high as praise comes. 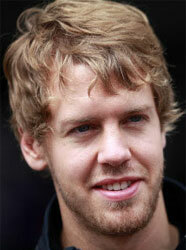 Should Sebastian Vettel be higher or lower in F1's greatest drivers?